The Balkan country's military was put on high alert Saturday after a military unit from the self-proclaimed Republic of Kosovo was deployed in the province's north while escorting Kosovar Albanian leader Hashim Thaci, who paid a brief, unannounced visit to the Serb-majority zone. "We have notified the Russian ambassador, along with the US ambassador and others, of the situation. In two days, I will be meeting with President Putin, and we will talk about all the important issues. Of course, the situation in Kosovo and Metohija will be the priority," President Aleksandar Vucic said, speaking to reporters on Saturday. "We will inform Putin of the latest developments and ask his support in all international forums. We will undoubtedly ask him for advice," Vucic added. Asked if this support might include assistance from the Russian military, as in the case of Syria, Vucic stressed that he would not like the situation to reach that point. "I would prefer that Serbia, with all our respect and love for Syria and its people, to be a peaceful country, a country with a developed economy, a country of the future, and I will do my best to preserve peace," the president said. Vucic is scheduled to meet Putin in Moscow on October 2, according to Serbian media. Kremlin spokesman Dmitry Peskov said Moscow considers it premature to discuss the issue of support for Serbia in connection with the aggravation of the security situation in Kosovo. "First negotiations must take place," he said, speaking to Russian radio on Sunday. Serbia's army was put on high alert Saturday after the deployment of Kosovo special forces in the vicinity of Lake Gazivoda in north Kosovo near the Serb-controlled Gazivoda hydroelectric power station. About 60 members of the paramilitary unit, wearing ski masks and armed with automatic rifles, briefly entered the Center for Ecology and Development of Sports near the lake while escorting Kosovo President Hashim Thaci. Local Serbs complained about being detained during the incursion, and described Thaci's visit as an attempt at intimidation. Thaci himself described the incident as a "friendly visit." Russian and Serbian military aviation are schedules to conduct military exercises on Serbian territory involving MiG-29 fighter aircraft and Mi-8 helicopters this week. The drills, scheduled to run from October 1-5, will involve 10 aircraft, and see training in the interception of air targets, air combat, tactical strikes against ground targets, search and rescue, and other training, according to the Russian Defense Ministry. The US and its NATO allies conducted a 78-day campaign of airstrikes against Yugoslavia in 1999 after accusing Belgrade of committing war crimes against ethnic Albanians in Kosovo. The attack lead to the deaths of as many as 5,700 civilians, and contaminated part of the country with depleted uranium used in NATO munitions. 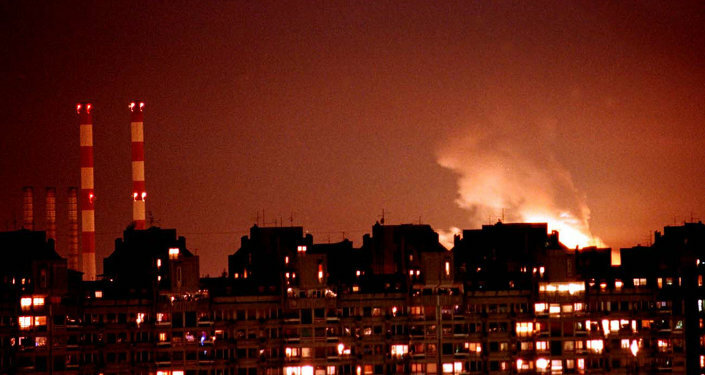 The bombing forced the Serbian administration in Kosovo to withdraw from the province. In 2008, with US and NATO support, Kosovo unilaterally declared independence from Serbia. Serbia and dozens of other countries, including Russia, China, India, Iran and Syria have refused to recognize the breakaway.